The United States (US) Ambassador to Ghana has observed that 63 % of public schools in Ghana have no electricity. The statistics, Robert Jackson said followed thorough survey credible organisations supported by the US had carried out in Ghana. “These are schools that are not connected to the national grid,” he explained. 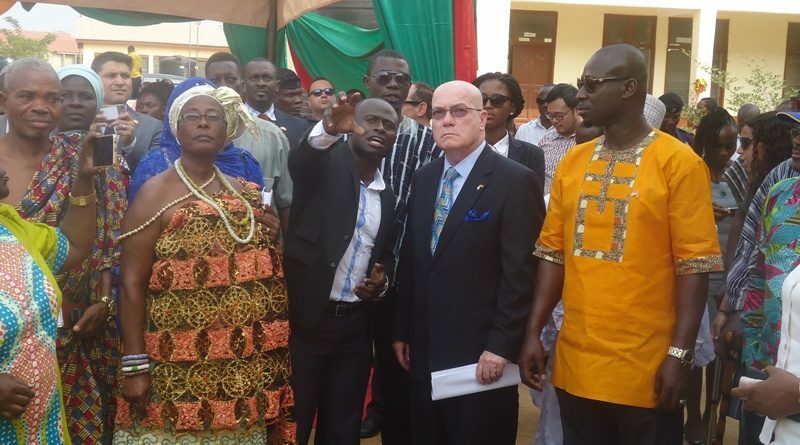 As a former teacher, the US Ambassador, therefore, said there was the need for Ghana to explore solar energy opportunities and invest in it especially in the educational institutions, to facilitate and enhance teaching and learning. Robert Jackson gave the startling figure at the Ashaiman Tsui-bleo Cluster of Schools, Greater Accra Region, where he inspected the installation of a 3.1kwp solar power plant financed and developed by Shinbone Development Foundation in collaboration with Novaya Solar and Shinbone Networks, USA. The US Ambassador said with the increasing demand for energy, there was the need for Ghana to aggressively hang on to the Millennium Challenge Compact for sustainable energy to meet the pressing demand. That way, entrepreneurship, which he said had largely contributed to the growth of the economy of the US for over 200 years now, could accelerate to building a brighter future for Ghana. Mahama Nyankamawu, Chief Executive Officer (CEO) for Volta USA and Novaya Solar Ghana, for his part, said five percent of Ghana’s Gross Domestic Product (GDP) was lost due to poor power outage. Mr. Nyankamawu explained that initial cost of installing solar plant was high; he explained that once it was completed, it was life-time and there would be no need in investing in it. His outfit, therefore, he said, was providing 3 megawatts of solar energy to farmers, health facilities, small business and schools and the Tsui-bleo Cluster of Schools was one of the beneficiaries of their project. The project would benefit about 2,000 communities in Ghana, he noted. He advised that energy efficiency should be a habit of Ghanaians in order to conserve energy. Ibrahim Baidoo, Municipal Chief Executive (MCE) for Ashaiman, was grateful to the US Embassy, Shinbone Development Foundation, Novaya Solar and Shinbone Networks, USA, for the life-time solar plant. The plant has a battery storage compartment, and the MCE said the Assembly would ensure that the facility was maintained. The school, hitherto, had no electricity supply, and so Mr. Baidoo was happy that the teaching of ICT, Home Economics in Basic Design and Technology (BDT) and remedial classes for final year students could be held effectively. The school becomes the first educational institution in the Ashaiman Municipality to have a solar power plant.